This is a very unusual and gorgeous Pyritized Ammonite found only in Russia. I wrapped it in Gold Filled Wire, and it hangs from a gold plated chain. 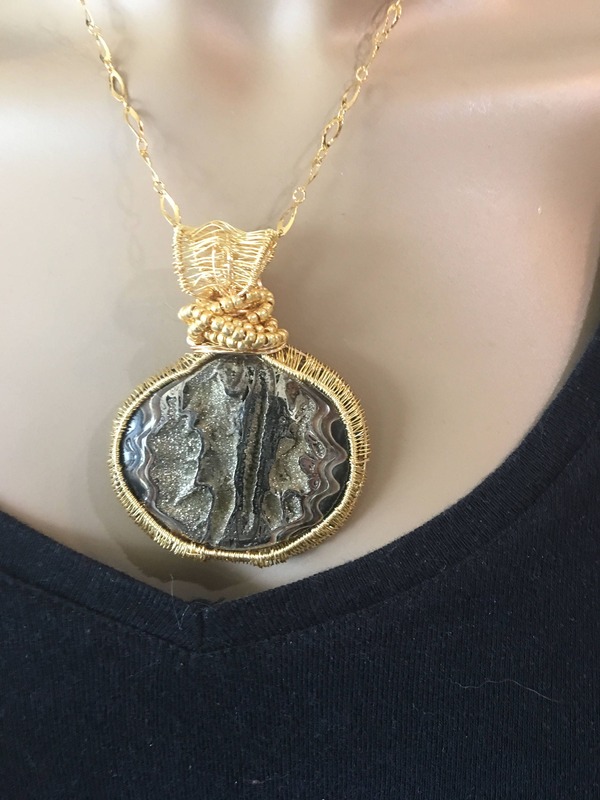 The pendant including the bail is 3 x 2 1/4" and it hangs from an 18" chain with a lobster clasp. This particular one is most unusual and rare in it's unique design on the front. 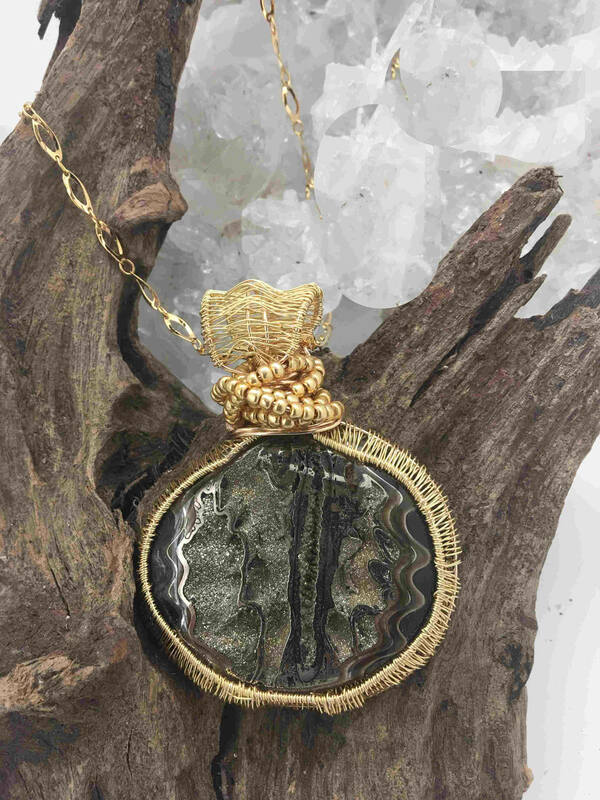 Both Ammonite and Ammolite were prized by the ancient Egyptian and Roman societies and likely many other cultures; as it was seen as a symbol of almost any deity that may have had any connection to curved horns. For this very reason they were considered sacred in Ethiopia; natives of the region adorned themselves with Ammonite and Ammolite as it was said to grant deep meditative states as well as assist in drawing prophetic dreams. It is said that these “stones” radiate positive Earth Energy, bringing luck as well as prosperity in all things. 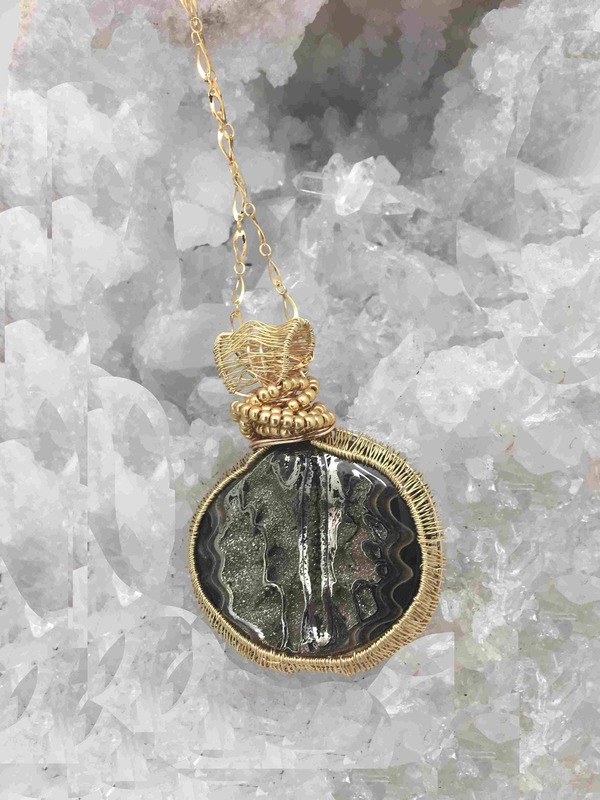 A very spiritual stone, even a small portion of Ammonite or Ammolite may be used to assist one in finding the proper way down the coiled, spiral spiritual pathway to the center where the God & Goddess await one’s arrival. A protective element, adding structure, stability and steadiness to one’s life as well as supplementing one survival instincts. Associated with water, Ammolite is known to deeply affect one emotionally. Mirroring feelings that one may have forgotten existed, whether they be healthy or unhealthy. Encouraging feelings of self worth Ammolite will enhance ones practicality and reliability; it has been said to increase the positive energies of magic spells and spiritual prayers.